The Garden Gurus have had a wonderfully busy few weeks, sowing, planting, growing and nurturing all their little ‘charges’. The weather has thrown everything it could at us, do you remember the hail and rainstorms? Then the drought, followed by warmth and cold, and that all before lunch time! But we’re used to it and have trusted our instincts and ploughed ahead with our plans! The chives look wonderful, masses of those fluffy lilac flower heads; and everywhere we can see the vegetables growing strongly. 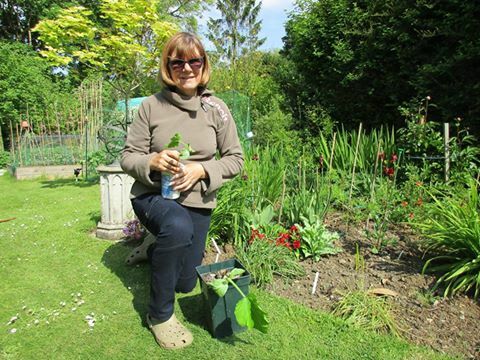 The potatoes really grew fast this year – Helen earthed them up and they quickly shot above the soil again! Does that mean we’ll have a bumper crop? There they are behind Jean’s rainbow chard, which seems to double in size every few days! She grew these from seed which she harvested from last year’s plants and it’s really paid off. The lettuces are being grown in batches and the rosy red lollo rosso and oakleaf varieties look so pretty together. 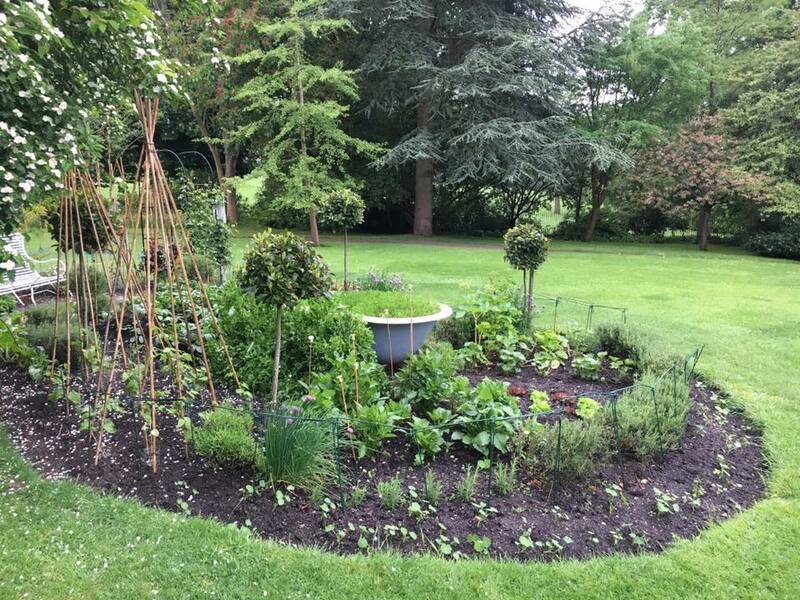 As we see they are flanked on both sides; Elaine’s dahlias to the left and the hollyhocks on the right. Last year we ate dahlia tuber rosti, and Elaine has planted a crop that she’ll harvest in the autumn specially for cooking! Yes, we really are an edible garden – if dahlia tuber rosti was good enough for our Mexican forebears, its good enough for us! I think we are all wishing our Giant Pumpkin well, fingers firmly crossed that Lilibet (as she’s been named by Sally, who did, after all, grow her) will thrive and do what Giant Pumpkins do best:grow and grow happy in her lovely playpen, crafted by our willow sculptress, Su. Helen’s Borlotti beans are romping up the two wigwams and the yellow and purple climbing French beans are doing their best but need to catch up. Jo and Gaye grew them and had to cope with too cold, too hot, and then cold again! We have been joined on the team by new guru June and Sue, our Super Snapper, records all the loveliness with her wonderful photographs. The Bath WI Garden Gurus are a close knit, supportive bunch of great gardeners and the results most certainly speak for themselves. Our hundreds of visitors love to watch the garden’s journey throughout the year, but for me this is the most exciting time , as nature takes over and surprises us yet again ! 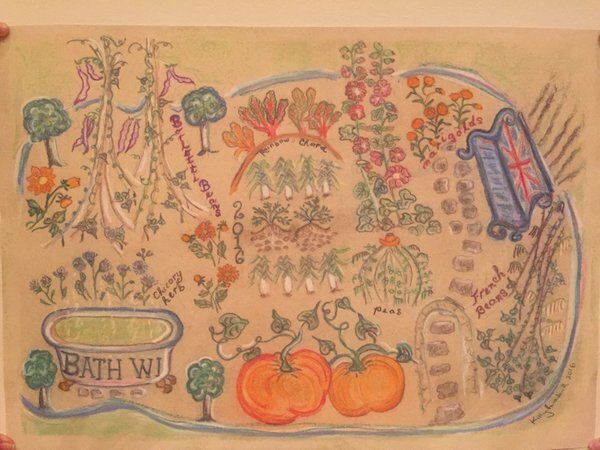 The Bath WI Garden is a close planted and very detailed kaleidoscope of herbs, flowers, roses and vegetables, and they all seem to love jostling happily together. Oh, if you are wondering what that crescent of round leafed plants are scattered rather untidily at the front of the photograph on the left, they’re nasturtiums! And will (hopefully) provide a great burst of oranges, yellows and pinks all summer long. We love them and so do the bees, which makes everyone a winner! Their seeds, pickled, are capers and delicious added to salads and quiches etc. Please come and visit the Garden, sit on the lovely Iron Art bench and pause a while. Crush the aromatic sages and thymes, fennel or rosemary between your fingers and enjoy the peaceful oasis we have tried to create for us all to share in this busy world.